One of the best things about the music streaming service Spotify is the platform's incredible ability to customize itself to the listener. Its automatically generated playlists are second to none, making it easy to find new music you like. 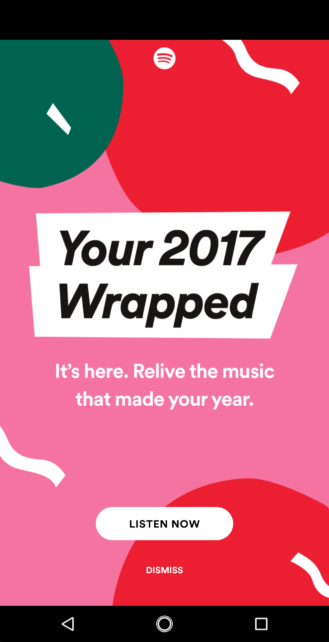 The holidays are also a special time for Spotify listeners, as we get to look back at the last year's listening habits in the form of customized playlists, and this year Spotify has turned it into an interactive experience: Your 2017 Wrapped. 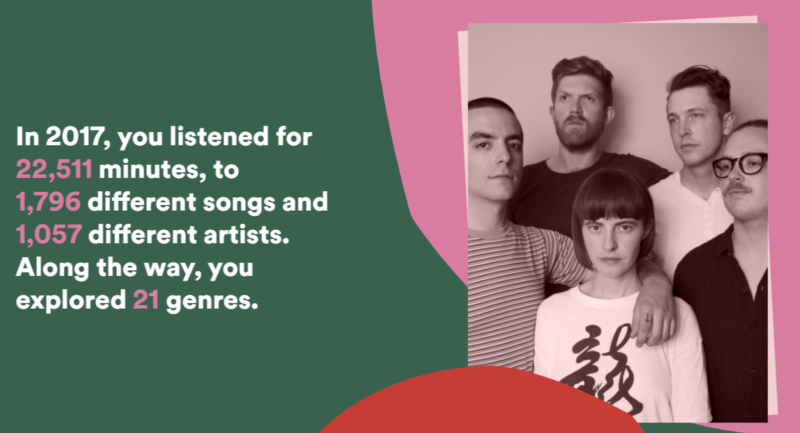 The new Your 2017 Wrapped is an animated analysis that plugs itself into your Spotify account data and provides you with some fun facts about your personal listening habits. 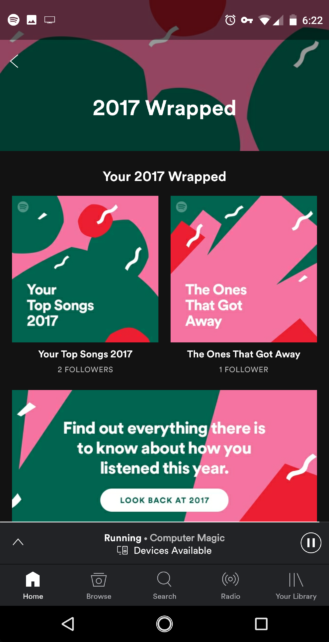 You get a complete survey of the music you listened to for the last year in an interactive format, as well as two customized playlists (Your Top Songs 2017 and The Ones That Got Away) to cap off the end of 2017. You should see an invitation to check out the new playlists sometime soon when you open the Spotify app on Android, and the interactive site works for both desktop and mobile. 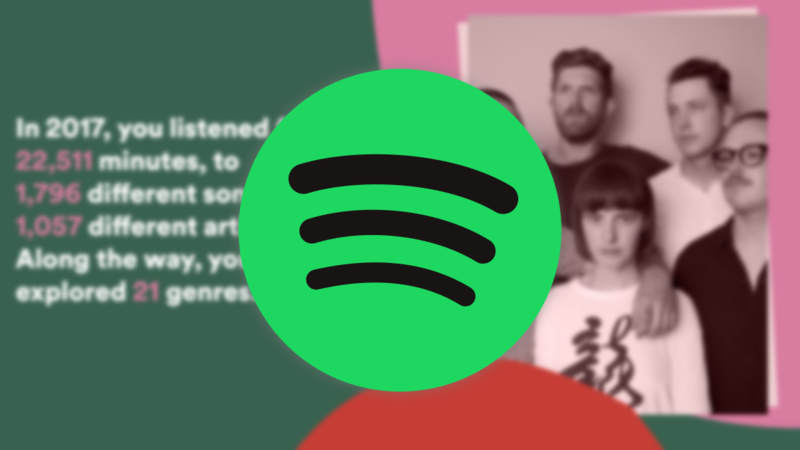 Each playlist should appear in the "Made For You" section in the Spotify Home tab, and a new Wrapped section containing both of the new playlists should also be present in Genres & Moods. Your 2017 Wrapped is divided into 7 sections. "Keep Discovering," the first section, shows off your total statistics like minutes of music played and the total number of songs played. "Be self-aware" is a fun quiz about your listening habits over the course of the year. As the section's title suggests, it requires a bit of self-awareness to get all the questions right. Other sections point to specific facts like the number of songs you skip or how your genre tastes align with different age groups on Spotify. You can even share your stats via Facebook or Twitter. But the two sections most likely to provide lasting entertainment are the custom playlists. The Your Top Songs 2017 playlist is pretty much the same as last year's incarnation but updated for 2017. You get your most played ~100 songs across all genres and interests on one list. If you'd like an example, you can check out my 2017 playlist, but you should get the idea. The other playlist, however, is entirely new. It's called "The Ones That Got Away," and it contains 30 songs that should be relevant to your interests but which, for whatever reason, you didn't play on Spotify. In my case, some of the music was stuff I had heard but just hadn't listened to via Spotify, but that speaks to the playlist's accuracy. If you're a Spotify subscriber, be sure to go check out Your 2017 Unwrapped and see how well you know your own tastes. I wasn't too surprised to find out which songs and artists I listened to most, but your results might be a bit more interesting. And even if you don't dig the data or quizzes, the new playlists should provide you with both some new recommendations and a concise musical retrospective of the year.